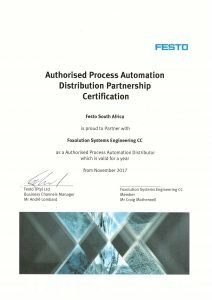 Festo, the global leaders in Process & Automation technology, have appointed Foxolution as approved suppliers & distributors for their products in South Africa. We have the knowledge and expertise spanning decades in the field of process automation. This has allowed us to develop a strong working relationship between the two companies. As approved re-sellers, we offer their full range of products to the South African market. These include state of the art pneumatic Regulators, Cylinders, Filters, Valves, Electro Pneumatic PLC’s (Programmable Logic Controllers), Fittings, Tubing and much more. Our expertise, together with a vast selection of quality pneumatic components at our disposal, allows us to provide custom engineered solutions for any application. To view the full list of products available to you please click HERE. Need help? Call us on (021) 785 4002 or simply use our Contact Form and we will get back to you right away.